Current City Council district lines in Uptown New Orleans. Most of Uptown New Orleans appears likely to avoid a political tug-of-war over redrawing City Council boundaries, though one proposal would change the representation for a handful of neighborhoods along Jefferson Avenue. Of the five proposed redistricting plans unveiled this weekend, four show no changes to representation Uptown whatsoever, and one slides six voting precincts along Jefferson Avenue from Councilwoman Susan Guidry’s District A into Councilwoman Stacy Head’s District B. For the last decade, all of Uptown has been divided between districts A and B along a line that runs the length of Jefferson Avenue from the river to Fontainebleau, then heads up Carrollton toward Mid-City. 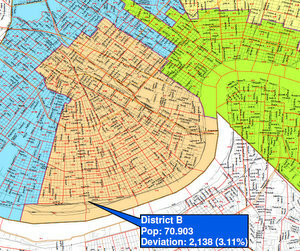 Guidry represents everything upriver of Jefferson into Lakeview (including the Audubon, Carrollton, Riverbend, and Leonidas neighborhoods); Head represents everyone downriver into the Central Business District (including Freret, Milan, Touro, the Garden Distirct and the Irish Channel); and both reach into parts of Mid-City. District A lost fewer people since 2000 than the rest of the city, so Guidry will have to give up some territory. District B’s population loss was about the same rate as the city as a whole, so it does not need any changes at all, and under some of the possible scenarios it simply is left touched. Most of the major conflicts between the new maps are centered along the lake, in Mid-City or in the Marigny. 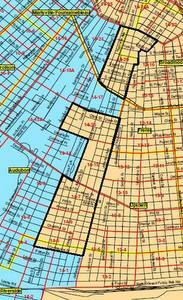 The precincts highlighted in black could be moved from District A to District B under City Council redistricting "Scenario 2." The map designated “Scenario 2” does hold some small changes for Uptown, as it would move six 14th Ward precincts from District A into District B, possibly so that District B could then give some of its Lower Mid-City precincts to the Gentilly-based District D. Those six precincts (14-5, 14-6, 14-7, 14-15, 14-16 and 14-20, if you want to check your voter-registration card) run roughly between Jefferson and State, and include a sizable portions of the Hurstville and Claiborne-University neighborhoods, as well as slivers of the Upper Hurstville, Audubon Area and Audubon-Riverside neighborhoods. Council members are waiting on public input before developing a final map. Contact information Guidry, Head and the other council members is available at the council’s website.